Finn Harps will be hoping to spoil the party at the Belfield Bowl on Friday night where UCD will be crowned First Division champions if they avoid defeat against Ollie Horgan’s side. The Students - long-time leaders in this division - sit five points clear of Harps, and with two games left to play, they need only a point to win the league. Even if Finn Harps win tomorrow night, UCD will seal the title if they draw their final match away to Longford Town. It all points to a title win for UCD - and Harps’ hopes of beating them for the first time this season haven’t been helped by the news that midfielder Mark Timlin will miss the game through injury. The Buncrana midfielder, who has been playing so well of late, sustained a knee injury playing for Harps against the Donegal League’s Oscar Traynor Cup team in a special friendly which marked the opening of the new pitch at Ballyare last Wednesday night. 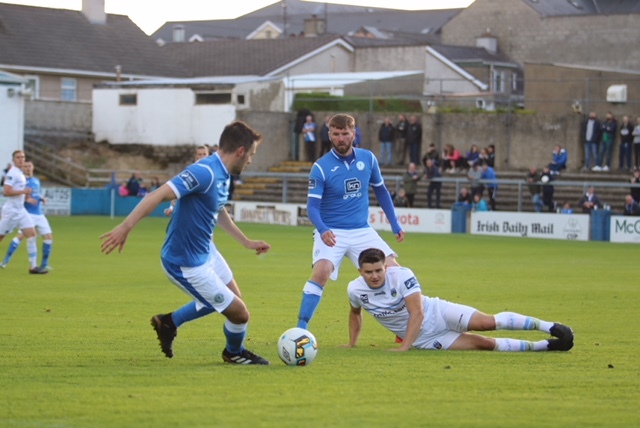 It was initially hoped the injury would clear up, but scans have revealed a more serious issue and while Timlin won’t play at UCD, the fear is that he could miss further games. Harps will finish off their league programme with a home fixture against Cabinteely a week on Saturday. Depending on the result of tomorrow night’s match, Horgan’s side might need to win the game against Cabinteely to secure a second place finish. Harps are already guaranteed a play-off spot, but Horgan said finishing second would be a major advantage. “Obviously we can still win the league,” he pointed out. “But look, UCD are absolutely flying at the minute. I had been hoping that they would maybe tire a little towards the end of the season, but if anything they’ve got stronger. “UCD are a better side now than when we played them this season, and remember they’ve beaten us twice already. Horgan did admit that he’s keeping one eye on next week’s game against Cabinteely as he prepares his team to play UCD tomorrow night. “I know we’re in the play-offs, but we can’t really talk about them until we know where we finish,” he said. While Timlin’s absence will be a major blow, Horgan has plenty of decisions to make as he weighs up his selection options for tomorrow night. Paddy McCourt returned from injury and scored as Harps won in the friendly at Ballyare. The midfielder is far from 100 per cent fit but he will still play a key role as Harps continue their bid for a swift return to Premier Division.